Abstract. A total of ninety-eight wild birds, comprising eleven different species were captured alive from Zaria environs. These birds were used for the study, to determine the possible role they play as reservoirs of blood parasites. Thin blood smears (TBS) were prepared from the blood samples collected from these wild birds. The slides were stained and viewed under the microscope for the identification of blood parasites. Values of packed cell volume (PCV), haemoglobin (Hb) and total protein (TP) were also determined from the blood samples. Sera from the birds were used for the determination of haemagglutination inhibition (HI) antibody titres to Newcastle disease virus (NDV). Haemoparasites, such as Plasmodium circumflexum, P. relictum, P. nouxi, Haemoproteus nisi, H. columbae, and Aegyptienella pullorum were identified from the blood of some of the wild birds. The highest mean HI antibody titre to Newcastle disease virus( NDV) (log2 9.50 Â± 0.1) and lowest mean HI antibody titre to 2 NDV (log2 2.50 Â± 1.7) were obtained from Senegal parrot (Poicephalus senegalus) and Northern red bishop 2 (Euplectes franciscanus), respectively. The highest mean PCV and Hb values of 49.00 Â± 0.01% and 16.30 Â± 0.1g%, respectively were obtained from Senegal parrot (Poicephalus senegalus), while the lowest mean PCV and Hb values of 36.50 Â± 8.35% and 12.18 Â± 2.77g%, respectively were recorded from African marsked [sic] weaver (Ploceus velatus). The highest mean TP value (7.00 Â± 0.01g/dl) and lowest mean TP value (1.88 Â± 0.54g/dl) were obtained from Laughing dove (Streptopelia senegalensis) and Zebra waxbill (Sporaeginthus subflavus), respectively. It was concluded that wild birds could serve as reservoirs of haemoparasites and viral pathogens which could be potential dangers to domestic birds in Zaria, Nigeria. Four weaver species were analysed: Northern Red Bishop Euplectes franciscanus, Village Weaver Ploceus cucullatus, Vitelline Masked Weaver P. vitellinus (listed as Masked Weaver P. velatus), and Speckle-fronted Weaver Sporopipes frontalis. 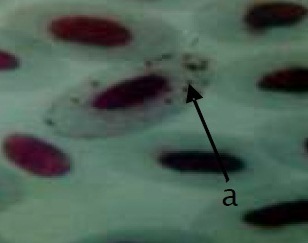 Figure above: Plasmodium circumflexum (arrow head a) in the RBC of Vitelline Masked Weaver x 100 (from pdf paper).